Modular body styles mounted to a variety of van chassis primarily used for Advanced Life Support and rescue work. The Type III is mounted onto a cutaway van style chassis. The Type III chassis features a shorter turning radius and lower frame rails. A lower floor height makes it easier for crews to load cots and other equipment and also eliminates the need for lowering features of an air suspension. The interior is designed with convenience and efficiency in mind. Crew members have everything they need within arms reach plus ample space for patient care. 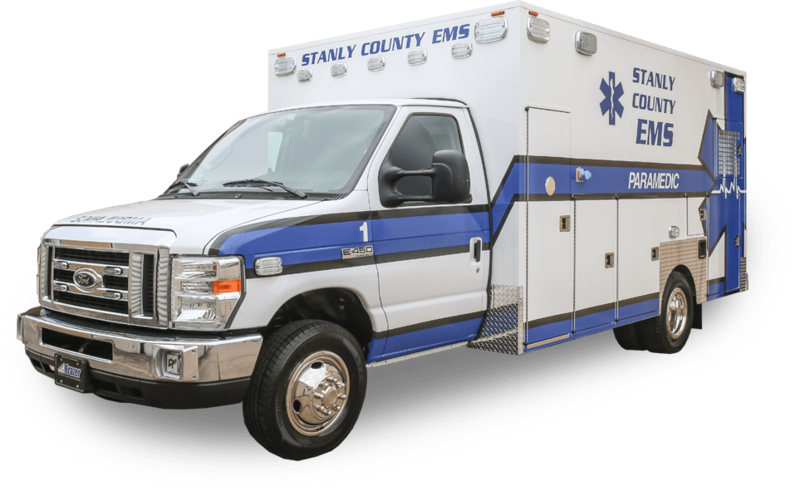 Learn more about our custom Type III EMS vehicle options and visit our Videos page to see customer deliveries and features! The Type III 14 ft module is the perfect solution for services that need extra space. The larger module interior accommodates more equipment and allows for larger paramedic crews to easily move around without limiting their interaction with patients. Extra exterior storage capacity allows for items like rescue gear, turnout-gear, extra backboards and any additional equipment your service requires. The Type III 12 ft module is perfect for most EMS services. A thoughtfully designed interior allows six medics to comfortably care for a patient at one time. Ultra-durable, all-aluminum cabinets are strategically positioned within the module to allow for easy access while seated and safe. Every Frazer comes loaded with abundant storage options that are designed to handle all of your life saving equipment.